In Part Eight of the series A Philosophy of Operative Wholeness, Rudhyar bring the series to a conclusion in a poetic synthesize. In a sense, the themes and poetic names and images found here foreshadow Rudhyar's great theosophical work, Occult Preparations for a New Age. Here we can also detect Rudhyar's growing interest in astrology. Indeed, Rudhyar's essential approach to astrology already appears well-developed (though not fully so) when he describes the astrological birth-chart as the Pattern and Soul of Destiny. Man is a hierarchy of forms and a brotherhood of functions. Man manifests his complex being in three forms. He exists as an instinctual body; he operates as brains; he is the mysterious and intangible center of spiritual essence located somewhat above the head, the thousand-leaved Lotus, or Sahasrara Chakra. Three types of forms and three corresponding types of substances. The substances constitute bones, muscles and membranes are very heterogeneous. They are divided into departments of activity each or which corresponds to an organic function of the instinctual body They are the common substances of man. The substance of the brains and of the cerebro-spinal nervous system, which constitutes the roots by means of which man-in-the-brains operates upon and draws sustenance from the instinctual body, is much more homogeneous and subtle. It is the aristocratic (in the true meaning of the term) substance of man. The substance of the great Lotus is as homogeneous as can be found on earth. It constitutes the throne of the One, the King-Hierophant; a throne which is a living cohort of spiritual Essences. Man who is whole is the three forms of one. That which correlates and integrates the three realms is the ever-mysterious Link that binds the Lotus to the Center of the brains and to the central chamber within the heart. It is the Pillar of Fire. Each form is the habitat of a type of consciousness, of will and intelligence. Each is a house with many mansions. Each mansion is a functional department. The principle of brotherhood of functions is established in all three realms; but in the lowest, functional units and cells often war against each other, while, in the highest, unanimity is an eternal fact. Thus Man’s total organization exemplifies the principle of hierarchical communism; which is the absolute, eternal and necessary principle of operative wholeness. This principle is the source of all patterns of organization which are truly cosmic, that is whole. For every such organization must needs encompass substances of various degrees of density and of various types of magnetism. Thus a hierarchy of form and brotherhood of functions is ever required, though the latter is not easily established in the lower realms where heterogeneity and the will to separateness prevail. One must add that even among the functional centers a certain type of hierarchy can be found; a hierarchization due to the fact that certain functions are never at rest and never indulge in sleep, while others have periods of relative latency. The heart never ceases beating from birth to death; but that is because in its shrine lives the flame of the mysterious One. The lungs operate rhythmically, by night as by day; but that is because they are linked with the brains and head-centers, of which they are the particular servants. The heart is the vehicle of the Spirit; the lungs of the Mind-Ego. Thus the meaning of the numerical relation between heart beats and full breaths. Thus the reason for breath-control in the various yoga systems. Thus the fundamental significance of the first breath, the time for which the astrological horoscope, the Pattern of Soul and Destiny, is cast. To know Man as an operative whole, one must understand the relationship existing between the three realms of form and the several functions (basically seven) in each. The three realms constantly interact. The wheel of functional activities in each affects the corresponding centers in the others. This is the principle of the permutation of Rays; knowing which, man ceases to be a sentimental about himself and begins to live scientifically and creatively as a whole. When this knowledge dawns upon man, he begins to think in terms of wholeness instead of in terms of chaos; and casting his mental eye around him he begins to realize that humanity at large is MAN. He realizes that humanity is an operative whole with a hierarchy of forms and brotherhoods of functions, the latter operating most distressingly and wastefully on the lowest realm, which we call human Society. Human society corresponds to the instinctual body of flesh and bones and blood; only it does not know it, or has forgotten it, and thus an endemic state of disease prevails among men and nations. The aristocracy of real thinkers, mystics and selfless doers of the will of God – that is, of all those who are approaching or have entered what is referred to as the Path, in whatever direction – represents the brains of MAN; and by brains we mean not only the intellectual centers, but all that is found in the center of the head. The White Lodge is the mystic Lotus, invisible and intangible. The threefold division is eternal and constant. We find it operating in the occult Druze brotherhood in the mountains of Syria, and in the true organization of the Tibetan Lamas. It was the basis of the three sections of the original Theosophical Society; the outer section, the esoteric section and the White Lodge. The interrelationship between these three realms of any fundamentally whole organization is of the same order as that between the three realms of Man. There is in all outer sections which are spiritually alive one who is the heart’s blue flame and thus the representative of the center of the Lotus; also a few who represents the lungs and acts as agents of the head of the brotherhood, providing "oxygen" – that is, spiritual ideas and energies. Still others carry orders outwardly or sensations inwardly through the spine, ganglions and nerves. In the inner sections there are some who correspond to the deeper centers of the head, pineal gland, pituitary body, etc., while the majority represents the brain substances, etc. As for the mystic Lotus, we must realize that its place is not really on earth, but in spaces above; that it includes the One, the Three and the Seven; that the One is the Pillar of Fire that links and integrates all. All things have been told before; but the emphasis has been but too often on the several petals of the Lotus instead of on the Light and Life of the One, who is the Integrator. People have dreamed excitedly about Initiations and adepts; but, how few have done anything about integration! Men love to aspire outward; but the One lives much more at the center of what they are now than at the periphery of what may seem the abode of gods. The One is at the center of the three realms, in the individual and is humanity. The supreme hierarch is he that lives, unpossessed and unaffected, in the three realms. 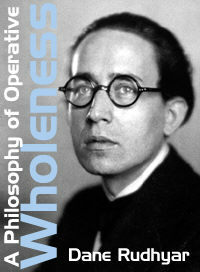 It is he that makes of all realms an integrated and operative Whole; for he is the principle of operative Wholeness. We of the flesh and bones see the One as a supreme Person; the inner order knows the One as a Principle; the highest beings are It differentiated. The One is the eternal symbol that relates circumference to diameter, Pi. It is the Door that negates all walls, all separateness, all polarizations. Enter through the Door which gives eternal life! For to have eternal life is to be whole permanently and unceasingly throughout aeons without end. This also is Mastery.